With the recent discovery of some IPC vulns in OSX (one, two, three) digging into the way IPC works in OSX came to the front of my TODO list. That, along with the re-write of launchd for 10.10.x, well, let’s just say it has thus far been a fruitful endeavor - that story is for another post. Which leads me to this post - why would I want to debug launchd? Mach is the low level functionality within the XNU kernel, which provides IPC between threads and processes; IPC endpoints are referenced via ‘ports’ (unsigned integers). Without going into too much detail about OSX IPC, the flows are very similar to DNS. When one process wants to speak to another process, it queries a special Mach port called ‘bootstrap’ (launchd in the context of OSX IPC) to lookup/provide-access-to the port of the endpoint it would like to communicate. This lookup is done via a string like ‘com.apple.networkd’. launchd responds with a ‘port’ that is used for the destination of future IPC messages. ‘bootstrap’/launchd is the first point of communication when communicating between two processes. The reason I had an interest in debugging launchd is because I had been able to trigger some crashes. 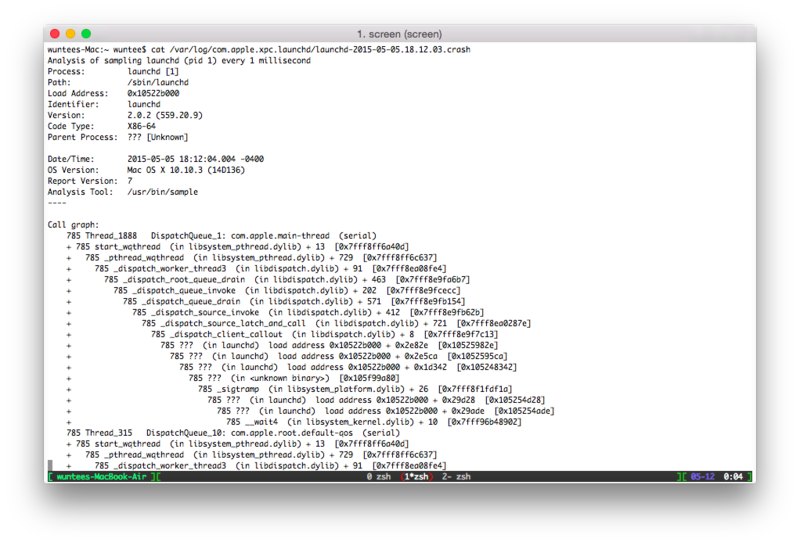 launchd is like init for linux; the kernel spawns it as PID 1 and every process is executed under it. When launchd crashes, the kernel panics, and your machine reboots with the “there was a problem, press any key to continue” screen. User-land triggering kernel bugs is obviously interested due to the trust boundary crossed. I initially thought this was some anti-debug trick Apple introduced to prevent debugging of the service. However, I got to thinking - if launchd is PID 1, and everything is spawned off of it, then if lldb was able to break lauchd, then lldb should be halted as well - something like the “chicken or the egg” problem. It would be like if you spawned a thread, and then put a breakpoint in the parent, but the thread still was running. It is just not possible. One of the useful things from this is that the crash log refers to a specific file/line of the xnu source describing why the kernel crash had occurred - the kernel will panic if launchd exits, and the bugs I had found cause launchd to crash. From everything I had read about other launchd crashes, there should be a crashdump file like any other process, however from the launchd re-write, I can only assume Apple had disabled that feature. In turn, you get a semi-useful /usr/bin/sample output located in the /var/log/com.apple.xpc.launchd/ directory. Although this gives a bit more information than the kernel panic, I still am leaps and bounds away from finding the root cause of these crashes. My next thought was to move to kernel debugging, and try and catch the crash before it jumped into the kernel. In order to enable kernel debugging (on the guest), you must set some specific nvram flags. The flags are just added together to make the final value to set (0x141 = 0x100 + 0x040 + 0x001). Flags are set using the nvram flag=value command. When dealing with kernel crashes, having to reboot and re-attach every time became quite annoying, so I found myself using the flags that waited for the debugger upon panic. From the host, you can now connect to the kernel debugger via lldb’s kdp-remote command. At this point, I started looking into the older kernel debug kit, and noticed there were some additional python libraries/functions for lldb that may allow me to switch context from the kernel to launchd. 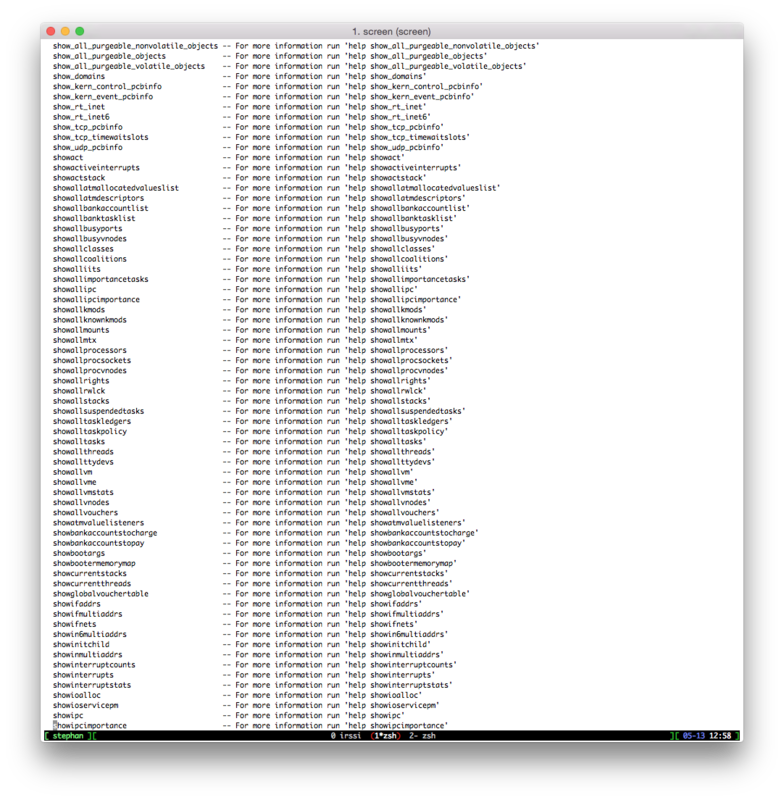 I spent a little time trying to get 10.9 KDK lldb libraries working on 10.10, but decided to just wait for the 10.10 KDKs to come out. While waiting for the 10.10 KDKs to come out, it came to my attention that older versions of launchd have been open sourced (code browser or tarball). Unfortunately, none of the above gave me an interactive kernel debuugger for launchd. 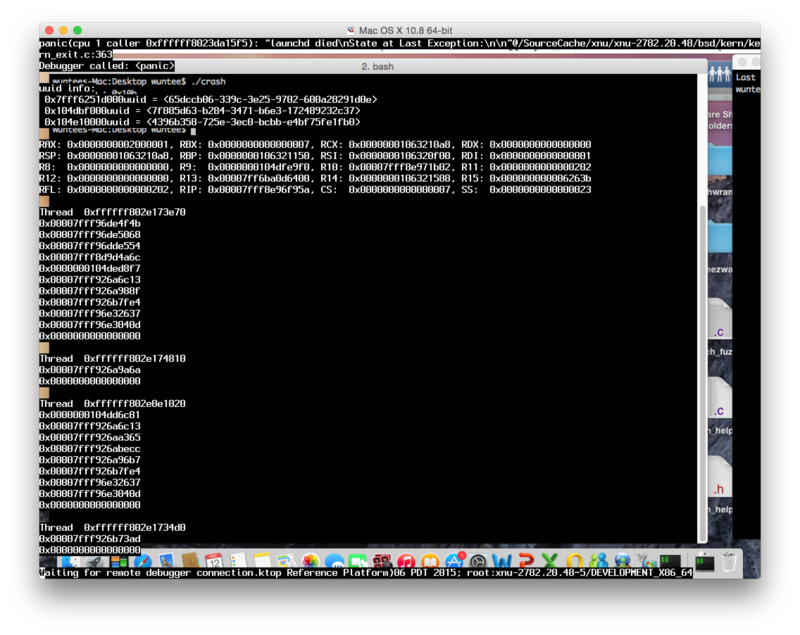 Upon kernel panic’ing, the debugger would still put me into the context of the kernel. Either I was doing something wrong, misunderstanding the code, or Apple removed this functionality with the re-write of launchd. During the first kernel debugging process, I had an epiphany: dtrace hooks happen at a pretty low level; I know there is a hook to perform actions upon applications exiting/faulting; if, somehow, someway, this fault hook would execute before the kernel panic occurs, I may be able to gain some additional information. And voila! I now had a specific location, within launchd, of where this crash is occurring. That being said, it was still quite hard backtracing to understand exactly why the crash occurred. 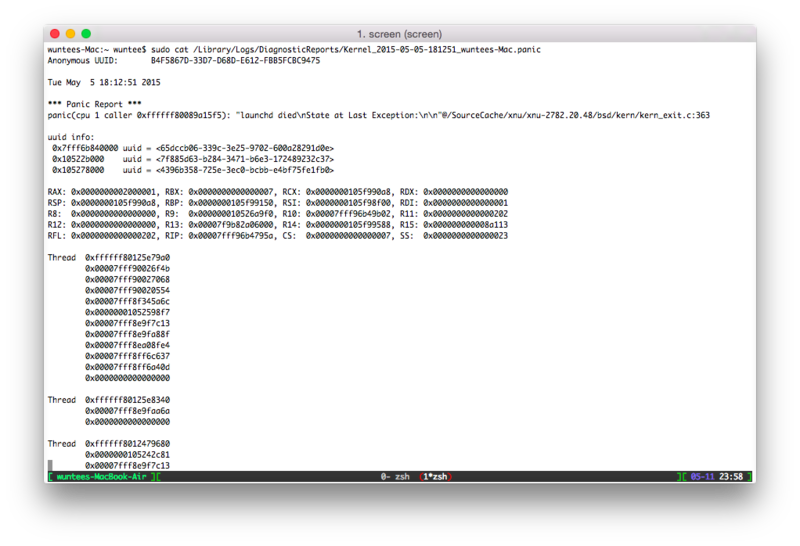 Apple releases Kernel debug kits (KDKs) with each version of their kernel. These packages provide debug/developer builds of the kernel, along with lldb scripts/functions/tools to help in debugging kernel/driver code. While performing the previous research, there was no KDK available for my version of OSX. Now, these additional tools did not provide any help to me while debugging launchd there are a WHOLE BUNCH of them and felt it worth noting. While writing this, I noticed some functions that may be of some benefit. Specifically showtaskstacks -F launchd, however the backtrace shows that it has jumped/switched context into the kernel debugger. This may not be a lost cause; I did spend too much time here. * the process's corefile ulimit. It looks like, if you are running a DEVELOPMENT or DEBUG build of the kernel and launchd crashes, the kernel will perform a coredump of launchd somewhere. 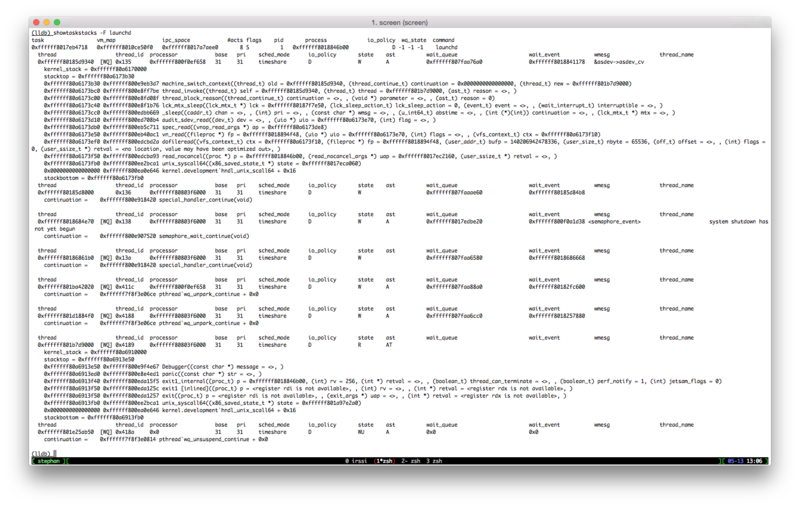 After a little more sifting through the XNU source, the file should exist in ‘/cores/core.[PID]’. The ReadMe.html in the KDK (/Library/Developer/KDKs/*/ReadMe.html) has details on how to install/run a DEVELOPMENT/DEUG kernel. After following that, triggering the crash, and rebooting I finally found a golden nugget - there was a file at ‘/cores/core.1’! 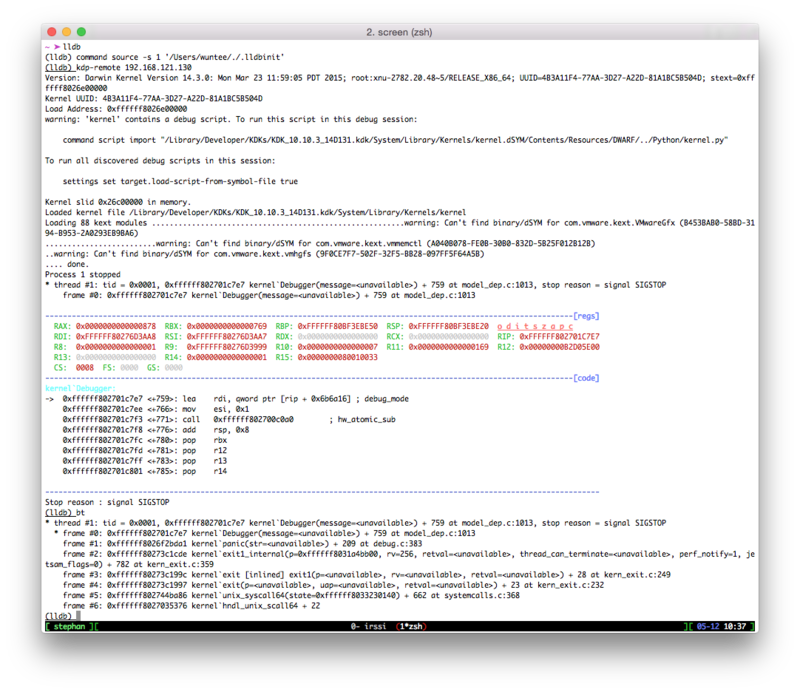 Opening the core.1 file with lldb (lldb /sbin/launchd -c core.1) I can finally at least dynamically debug the crash. Which, unfortunately seems to be a null pointer dereference, however I haven’t fully debugged the root-cause to understand full impact.